At Market Mall Denture Clinic, we are committed to providing you with products	that you can rely on to protect your teeth. Mouthguards fit snug over	the teeth and are designed to protect your teeth while you are playing	a sport. They leave you free to focus on your game, while knowing that	your teeth will stay safe and sound. Mouthguards can be customized for both children and adults. 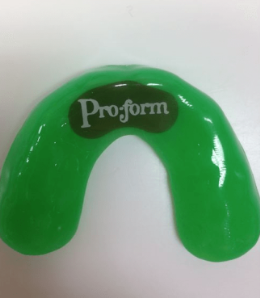 We utilize	only Proform sports mouthguards, which have proven themselves to be extremely	effective in protecting teeth and will not impede your breathing. We offer	a variety of colors and styles, so talk to our Calgary staff today to	learn more! For more info,	call us today at (403) 247-6222.